Wondering what to do with all the cilantro in the garden? Can’t seem to keep up with it? Worry no more! My neighbor and friend (Thanks Linda!) brought over a big bucket of cilantro for me because she didn’t know what to do with it all… I instantly thought of pesto. Who says you can only use basil to make good pesto? 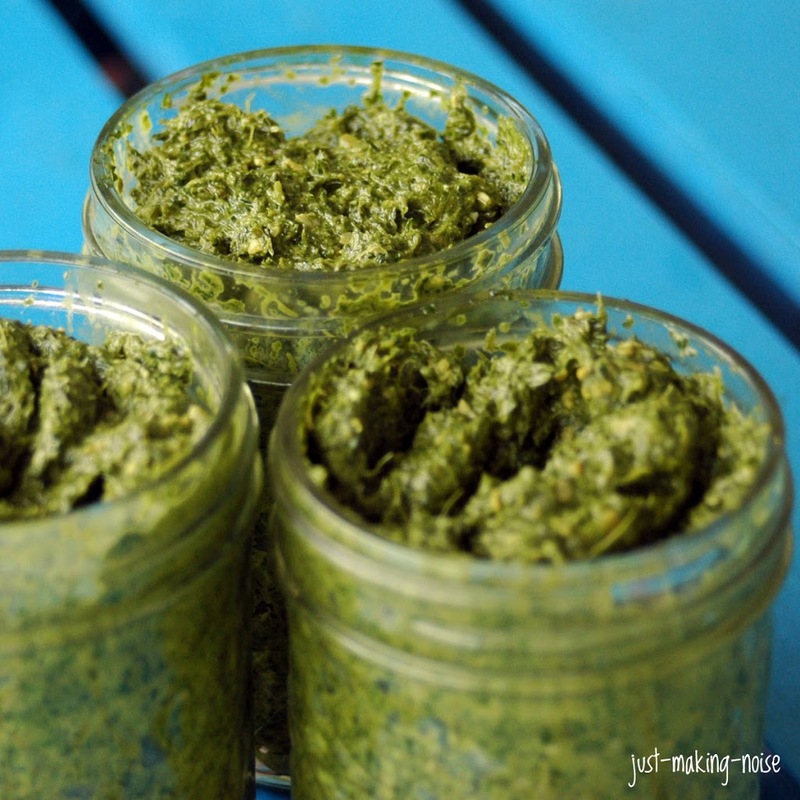 This recipe makes about 1 cup of pesto and I made about 4-5 cups of pesto. I’ve found the best way to keep the flavors consistent is by making it in small batches. It is also easier to process. While making this I decided to make it more Mexican style. Instead of the traditional pine nuts… I used pepitas (pumpkin seeds) and even added a big dash of hot chili powder to give it a little kick. It tasted delicious topped on raw cheddar cheese… hmmmm! There is so much you can do with pesto and I love how it freezes so well! You can store them in small pint mason jars and store one in the fridge and the rest in the freezer. 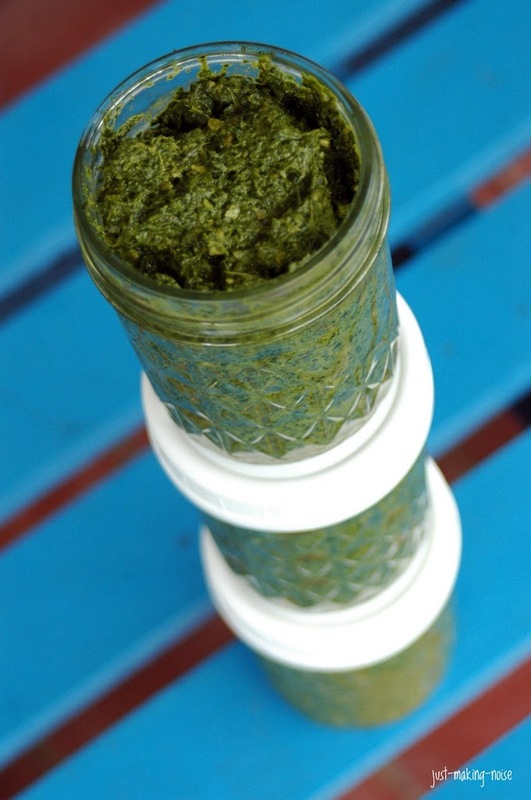 Pesto is good for a couple weeks in the fridge and up to a month or longer in the freezer. Place cilantro in food processor or blender. Pulse till well chopped. Add garlic, sea salt, pepitas and chili powder. Chop well. Using attachment for adding liquids drop by drop and, while running, add olive oil to form a thick paste. Scoop paste into pint jars and store in fridge or freezer. It sounds so good Mare! I am going to try this once I get back to the Ranch! This sounds like a great way to keep the summer flavors alive even after the weather cools, if you were to freeze some. Looks delicious. I’d enjoy this over some fish! Awesome recipe. I’m going to make me a batch. It will be a great addition to recipe collection. Thanks. I had no idea that you can use cilantro as a substitute for basil, I have to try this one out because I love the flavor of cilantro in many dishes. These looks delicious – and what a beautiful color! I am not a huge fan of traditional pesto, but I think I would love this! super yummy idea. and very frugal compared to the cost of pinenuts. 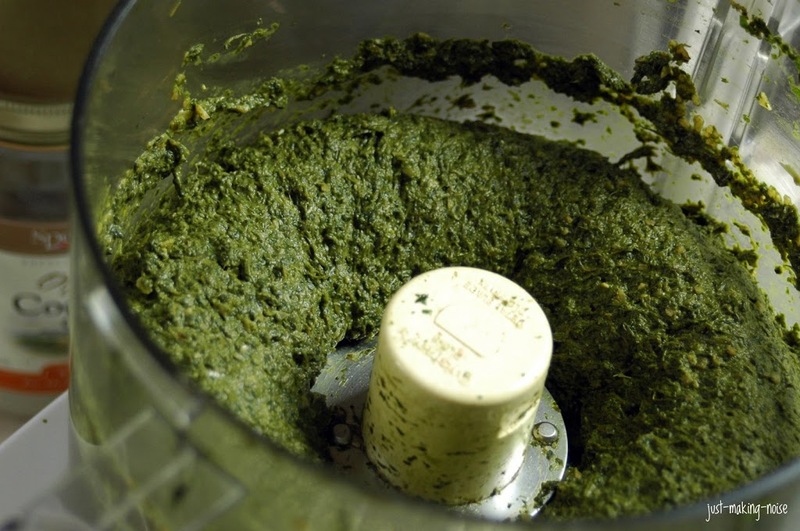 It is a very interesting and creative way of making pesto, well done! I just started following your blog, I LOVE IT! I gave Abby cilantro pesto when she had lead poisoning because cilantro can help rid a body of heavy metals. Candy also tried it with Rede and said she noticed a difference in his awareness. With the littler ones, go easy on the cayenne, though. can’t wait to try it…. yummmmmmm!